Find the Perfect Gift and Personalize It with Personal Creations! I recently was introduced to the great site, Personal Creations, that offers almost every type of gift you can imagine AND personalizes them!! I seriously spent hours (it felt like!) going through all the options! They have great gifts for Christmas, Halloween, Birthdays, and Bridal Showers! Find and personalize the perfect unique gift for any special occasion at Personal Creations. From wedding presents to birthday gifts, anniversary gifts and every occasion in between, they will help you find the perfect choice in unique gifts for any occasion to show them that you care. A personalized gift from Personal Creations shows that you spent time to find that "just right" gift for the recipient. Give a gift that comes straight from the heart that your recipient will cherish forever. Many of our gifts are exclusive to Personal Creations and are always 100% satisfaction guaranteed. Halloween is the next big holiday and Personal Creations can help! Get a head start on your ghoulish Halloween gifting with spooky, yet fun, halloween treat bags to cute candy bowls to trick-or-treat home decor. Shop their Halloween apparel boo-tique for kids of all ages. Make this years Halloween one to remember. Invite the wicked witches, creepy pirates, blood sucking vampires and haunted ghosts for a spine-chilling fun time! And if you are already getting ready for Christmas, make sure to check out the Personal Creations' wonderful selection of unique and personalized Christmas gifts for the whole family. Don't forget to deck the halls with our wide range of Christmas decor for the home. Custom to your family, personalized with your name. I immediately went shopping for my son's birthday presents - he turns 3 on Friday!! I found some great gifts from Personal Creations and I know he WILL LOVE THEM for a long time! I generously received the Personalized Name Coat Rack and the Youth Birthday Candle Hat and I can't WAIT TO GIVE THEM TO HIM! 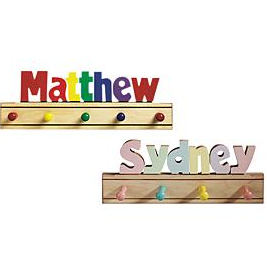 The wooden Name Coat Racks will help to teach my son responsibility, as well as how to spell his name. Coat rack measures from 16"L x 6"H x 1"D to 20"L x 6"H x 1"D with either four or five pegs, (depending on the name). Crafted of sturdy maple or ponderosa pine and non-toxic paint in pastel colors, with smooth maple or ponderosa pine and non-toxic paint. This coat rack will be perfect in my son's room in our new house someday to hang his coats, robes, winter gear, and so much more!! 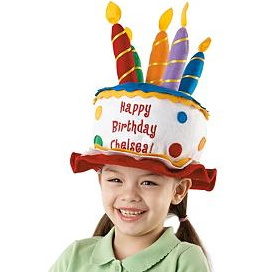 The Youth Birthday Candle Hat is so much fun and a Personal Creations Exclusive! My son LOVES birthday hats and now he has one that is all his own for years and many birthdays to come! It features “lighted” birthday candles, polka dots and a bright red brim. They embroider any message on 3 lines, up to 12 characters per line. Made of felt. Spot clean. Measures 11 1/2"W x 9"H x 7 1/2"D.
So next time when you are looking for a great selection of personalized gifts for all occasions, head over to Personal Creations - you won't be disappointed! Buy It: You can purchase the Personalized Name Coat Rack for $44.99 and the Youth Birthday Candle Hat for $9.99 on the Personal Creations website.